If Friday's win over the Denver Nuggets is any indication, this new version of the Philadelphia 76ers might spell trouble for the rest of the Eastern Conference. Coach Brett Brown wasted no time implementing new forward Tobias Harris and showing the NBA the potential of his loaded starting lineup, dubbed the Phantastic 5 by NBA poet laureate Tim Bontemps. In crunch time against the No. 2 team in the West, the Phantastic 5 were marvelous. The lineup took over in a tied game with 4:09 remaining. 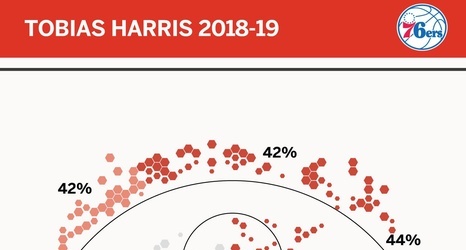 Harris immediately drained a 12-foot floater, initiating a 14-7 game-ending run that turned a nail-biter into a breezy victory.